Guess I was really, really desperate for the sounds of some racin' motors, eh? As I actually sat down and watched; Err listened to the whole Bloody 'RASSCAR first ever Day Toner 5000 "Knock Out" Qualifying session last Sunday morning. Hey! If only Indy Cars would go racing one of these years, then I wouldn't be compelled to watch 'RASSCAR; CRIKEYS! As I've got several thingys to say 'bout I-T! Most emphatically being, like put a cork in I-T Mikey! As 'Ah Shucks Michael Waltrip who was racing said that the Fans got one helluva 'O show... As I'm NO math genius, but 20mins On-track for a 2hr television program AIN'T a hole lotsa racing! Since, for humor's sake, and to make a point I suppose. I decided to keep track of the time allotted to actual racing during what I've loosely coined as RASSCAR's Snow Job! 10:12-18)Second round of Blather from the vaunted "Hollywood Hotel;" Yuck-yuck-yuck! Although first three minutes of segment (10:12-15) was devoted to Chris Meyers lobbing "Softballs" at Brian France with remainder of segment devoted to all three driver analysts Sucking NASCAR & Brian France's Teet's! 10:21-24) Invocation = 1min, National Anthem = 2mins. 10:52-56) Best interview of entire day by Jamie Little with Clint "Fisticuffs!" Bowyer, who was overly H-O-T! Over the #42 with dented rear fender ballooning in breeze slowing him down and how it was a TRAVESTY to spend 6mos preparing a car for NASCAR's Spin 'O Roulette Wheel for who's gonna be on Pole for the Great American Race; Chu-Ching! 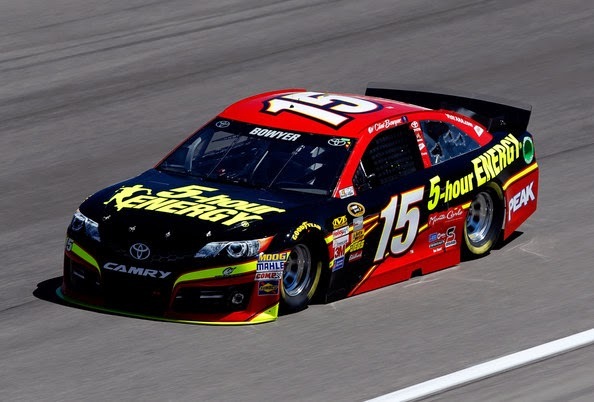 As I won't be surprised if Bowyer gets fined for speaking his mind and not being A-L-L Rainbows 'N Bunnies over NASCAR! Although I applaud his total candor & hope NASCAR will allow drivers to speak like this in the future! Amazingly! As I'd been expectin' Darrell "BOOGITY-BOOGITY-BOOGITY! Waltrip to pronounce another First for RASSCAR! Regarding the Knock Out Qualifying format, Mike Joy actually confessed that the format has been used by Formula 1 and Wink-Wink, Nudge-Nudge," Other Series..." Hmm? C'mon Joy, you can say IndyCar On Air, right? Hooah! As the whole production, which featured less than 20mins actual racing seemed overly pathetic! Albeit think it was Group 1B? Which saw the lead pack tossing out anchors, i.e. ; reducing their speed by 10mph minimum! In order to try preventing the followers posting higher speeds then theirs, in what could have been a very scary accident! Thinking it was 'DW who mentioned how Matt Kensett had threaded the eye of the needle! Nice hearing Jamie Little's voice again, as she seemed to be the lead Pitlane reporter called upon the most - with two great interviews with Bowyer and BAD BOY Kurt "F-Bombs R-US!" Busch lamenting how STUPID the new qualifying format was! To which Hamlin replied it was Mayhem when asked his thoughts on the first Qualie session. Also heard the familiar soothing tones of Chris Neville along with Matt Yokum as Pitlane reporters. And pretty funny that Queen Danica only got 15+ seconds of Facetime during the first promo-segment of broadcast and then nary a peep upon her! As all four of Stewart-Haas's cars failed to advance to the final 12-car Pole Shootout, along with zero Ford's making the dance, as so much for parity; as I found the whole broadcast to be choc 'O block with "Tom Foolery" to say the least, like cars sitting on Pitlane for half of their allotted running time! And then it was over at 11:43AM! With just the front row being decided, having not bothered to watch 'Dem Gatorade Twin 463 Duel's; Hya! As now it's almost time for the Great American Race to begin this Sunday, which think I'll skip! Unless it gets rained out and goes Primetime Monday Night with Juan Pablo "MAC" Montoya hitting' a Jet-drier; Oh Never Mind!